Jeffrey kicks off the session recounting tales of what the panelists did to get their pair of Glass. You can follow Danny’s interesting tales in Glass on Google+. Matt got his at the I/O Developer Conference this year and has been reporting on it since. Barry tweeted that he’d develop a number of apps with a focus on Jewish culture, and he’s so far developed four or five. Reva said she’d do a number of things with Glass in the Twitter contest, including take photos of people’s shoes on the subway and (finally, effectively) give people directions in Manhattan. Jeff has handed his off to the mobile app developer of his company. 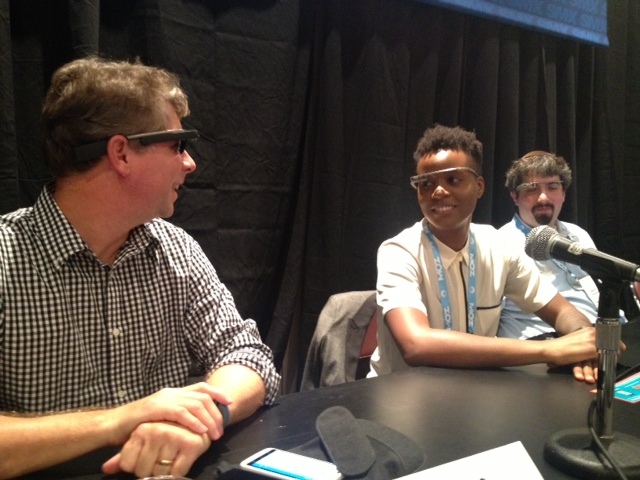 Danny Sullivan, Reva McEachern and Barry Schwartz wearing their Google Glass. Photo by Ric Dragon of DragonSearch.net. He tells his Glass to take a picture and it takes a photo on Reva’s as well because his voice is so loud with the microphone. Over the course of the next 5 minutes Matt is having difficulty connecting to the Internet. The Google Glass device relies on your Android phone’s Internet connection. He would like to show us directions, saying that’s one of the features he likes and uses the most. Danny: It’s great for sports. You can clip in sunglasses, which is great when you’re doing outdoor activities all the time. You can keep your hands on your bike, or paddle, or the wheel of your yacht, and take photos at the same time. Driving directions – it’s really smart and can reverse the directions from when you came when it’s time to leave. He also notes that the Field Trip app allows for useful interaction with the world around you. Reva: Interesting new perspective for capturing video; even mundane activities are colored in interesting ways. It’s great for capturing events since you don’t have to take yourself out of it to be a viewer. She hasn’t ended up using her Glass to take photos of shoes on the subway and write short stories about it, like her contest tweets, and she says that it needs Instagram. Barry: He likes it for driving, as a hands-free device. Danny had mentioned that he thinks Glass should be banned while driving. 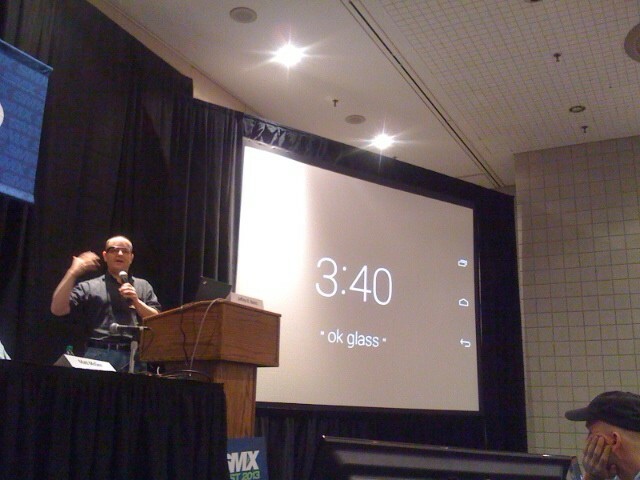 He thinks it’s cool for developers since Google can predict things about users when on a Glass device. Matt: When he got it in May he’d only find it useful for pictures, video and directions. There weren’t many apps available for it. Now there are more apps and he’s seeing RSS feeds and tweets and he’s finding he’s wearing them at his desk, much more of the day. Receiving info instantaneously is his big like. Barry: Battery life. The developer kit is weak. The Mirror API that developers rely on requires requests get sent back and forth through Google so non-native apps are slow. Reva: Battery life. Surfing the web – websites aren’t designed for this experience. But generally it’s hard for her to issue complaints on a device that’s so revolutionary. How do you complain about something that’s never been available before, and is doing something that was never imagined before. She also mentions that she likes texting with the device. Jeff challenges this point and asks why it’s any different than wearing a camera if that’s what she uses it for most. She says that just because that’s what she’s using it for most, their are uses for it we haven’t invented yet. Matt: Battery can drain from 100%-0% in 45 minutes if you’re shooting video. Danny: You can’t fold them up and store them – there are no hinges where there are normally on glasses. The promise was that you’d be wearing them all the time, but he finds he makes conscious decisions of whether he needs the extra capabilities at that time. The additional distraction has its pluses and minuses, but mostly positives. He realized this when he had to turn them in for repairs for a week when it got slightly damaged because it had been in a moist environment. Jeff: Being a center of attention as an early wearer, he finds he’s a magnet to teenagers. Danny: He hasn’t found that level of awareness where he lives in Orange County and so he hasn’t been bothered by that reaction. A downside of Google Glass: Glass-holes, those over-eager users who are showing off their device like they’re so special. The prime example of this is Robert Scoble. Q: Has Glass solved a problem for you? Danny and Matt say that the heads up display has given them their hands back and let them not be face down in their phone as they’re walking. Matt points to the Sherwin-Williams Color Snap app, where you take a photo and they let you know the paint colors that match, saying that’s a creative way to think of marketing for this device’s unique capabilities. Reva: She doesn’t think there will be one device to rule them all, expecting watches, for example, to become available. Information that’s timely and relevant will be the key. What wearable devices do is bring Knowledge Graph, social graph and link graph together and displaying it in a unique way. 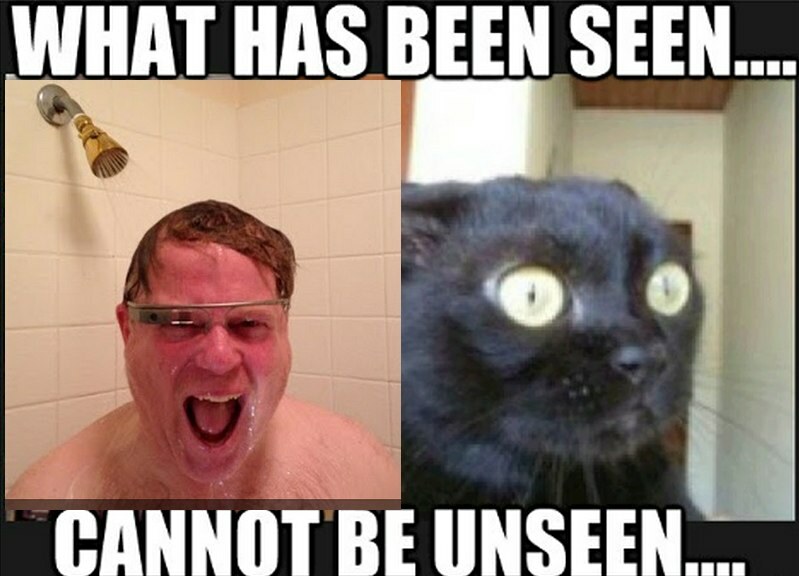 Q: How will Google Glass affect organic optimization? Will Siri? Barry: Voice search does affect queries. Matt: If you’re a local business, it’s imperative that you rank #1 because Glass shows results one at a time. They’re called cards. How many people are going to swipe through all 10 cards compared to trying the first one. This device favors Knowledge Graph, street view — a lot of what Google’s been doing the last few years all ties together with this device. Danny: Prediction aspects and suggestions and location aware type stuff — this is big. When Field Trip started kicking in suggestions, he could see how an advertiser would target this user, or possibly organic results could show up. Danny: Glass isn’t something to compare to a Segue, but rather, compare it to an old school brick cell phone. Wearables makes sense, and this might not be the form that takes off, but they will take off because they make so much sense. They won’t make phones obsolete, but they’ll be part of the required tech outfit. Samsung’s smartwatch was announced today, and he doesn’t think that will gain mainstream adoption, but if/when Apple releases one, that probably will. Matt: He expects that different devices will find their audiences based on their preferences. He says Google will expend a lot of energy to educate people to how to use the device and technology in everyday life.